We all know that horse riding can be a risky sport and will, no doubt, have friends or acquaintances who may have been injured. In my line of work I meet many people who wish to regain their enjoyment of riding after such an experience. It’s not always easy but with time, effort and teamwork it is perfectly possible. I recently asked on facebook for volunteers who are prepared to share their stories and will be publishing a couple of these over the next few weeks. I am sharing these, not to scare you but to show you that there is hope and that recovery is definitely possible. Carol is someone who I have worked with and she has kindly volunteered to mention that in this piece. Thank you for being prepared to share your story Carol, and I commend you for your honesty, bravery and hard work. Summer 2015 is when everything changed for me, circumstance and bad advice led Owain to spook whilst being given a bad leg up causing me to land hard on his back, he bolted and swerved sharply to the side causing me to fall. I tried to land on my feet rather than hitting my head on the fence, as soon as I hit the ground I knew something very bad had happened. I was transferred to Glasgow where I was horrified to learn the extent of my injuries, on my landing my ankle had dislocated, then my knee causing my femur to crash right through my tibia, I had over 30 breaks to my leg and not much left of my tibia itself it was crumbled, my surgeons likened it to a head on collision car crash or a motor bike crash it was so serious I was told I might never walk on it again and could possibly lose it all together if surgery didn’t work. I had 6 hours of surgery, 4 weeks in hospital another six flat out recovery, I was told not to even think of riding for at least 2 years I was devastated, I have 3 large plates ( they had to make them specific) partial knee replacement and 26 screws holding my leg together now. It was during my recovery I started to let the thoughts in …. 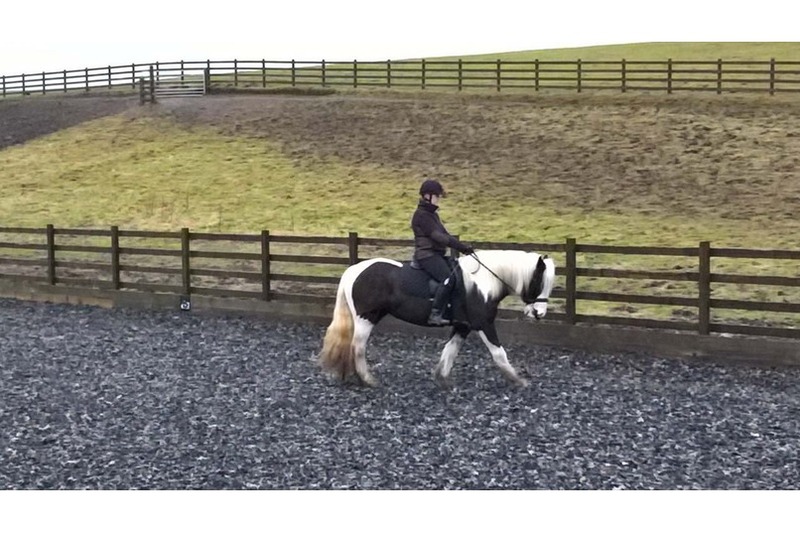 the doubt whether I was capable of riding Owain, looking at stronger bits , reading up on calmers for him all sorts of things, I was very lucky to have a excellent instructor who assured me I was more than capable of riding him but the doubt set in. Much to the horror of many people I wanted to ride Owain and 14 weeks after my surgery I managed wearing a brace on my leg to climb on only for a few minutes but I was on. I had to start riding again or give up. I started having lessons on him again every week just walk small bit of trot as I couldn’t still walk properly, i felt good at first but always made sure someone always held Owain and never left me alone, I felt sick getting on always thinking of the what if. Over the months I was riding more and more but still felt sick and apprehensive getting on and off because of the what if … what if he spooks again … what if I fall again … my guts churning, I always had to have someone beside me. I was growing more confident I even had a fall after an enthusiastic jump over a muddy puddle but I seem to put that away but getting on really still haunted me. I would think about the what ifs constantly before riding and end up going to the loo, feeling sick dry mouth … I knew I was a capable rider but always thought the worst before hand. I seeked help from Jane about my confidence and the going’s on in my head, I knew I could ride him my instructor instilled that in me but my head told me I couldn’t. Jane taught me to change the way I think,to look at things from a different perspective to not let spooks grow arms legs and tentacles…. deal with it ride it and put it away, never dramatise it that’s when the arms legs tentacles grow. I’ve fallen twice since my accident and managed to have a good laugh about it, we all fall it’s just how we deal with it in the end. It’s now over 3 years and don’t get me wrong I still have the odd nervous feelings but generally now I just get on and enjoy Owain and we are achieving things now I could only have wished for before thanks to my wonderful friend and instructor Karen and Jane for helping me with my demons , and of course my lovely welshie Owain who has looked after me faithfully since that terrible day.